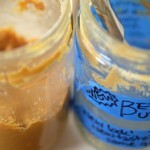 See the story of how I was nudged into making my own peanut butter by circumstances beyond my control. UPDATE: I improved this recipe, here. For smooth peanut butter: Place the peanuts in the work bowl of a food processor. If desired, add salt, honey or sugar, and/or oil to taste. Pulse the nuts until smooth and viscous, about 5 minutes. Use a spatula or wooden spoon to push down the peanuts two or three times. When the peanut butter is ready, it gathers itself into a rough rough ball and rolls around on top of the food processor blades. Taste and adjust the seasonings, if using. Transfer to a glass jar and store at room temperature. For chunky peanut butter: Place ¾ pound peanuts in the work bowl of a food processor. If desired, add salt, honey or sugar, and/or oil to taste. Pulse the nuts until smooth and viscous, about 5 minutes. Use a spatula or wooden spoon to push down the peanuts two or three times. Continue pulsing until the peanut butter gathers itself into a rough rough ball and rolls around on top of the food processor blades. Push down and spread out the peanut butter ball at the bottom of the work bowl, sprinkle in the remaining ¼ pound peanuts, and pulse until the peanuts are chopped and incorporated into the rest of the peanut butter, another minute or two. Taste and adjust the seasonings, if using. Transfer to a glass jar and store at room temperature. 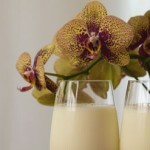 This entry was posted in Nuts, Recipes on March 24, 2014 by sandra.